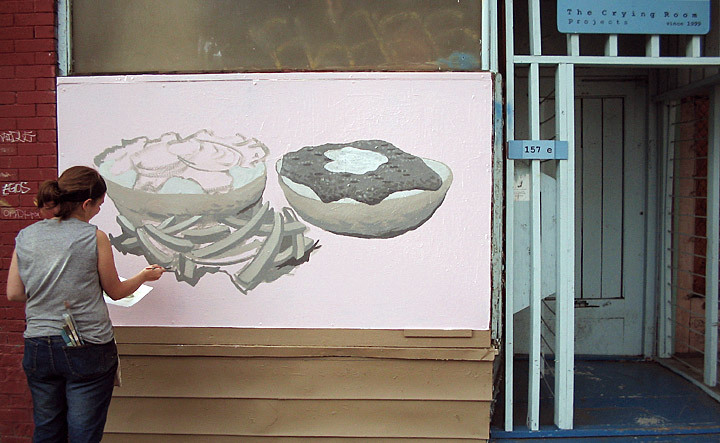 The Crying Room began in 1999 by Vancouver artist Colleen Heslin as a gallery space to exhibit local emerging artists. Several artists along the way have helped shape and form the exhibitions and direction of the space; Elizabeth Zvonar, Jason McLean and Steven Horwood played vital roles for the inception, content and context of the space. The Crying Room has presented and hosted over 50 exhibitions with a wide range of media: drawing, photography, collage, books, dolls, sound, installation, performance, sculpture, mixed media, video, posters, drawing booths, G8 action figures, concerts, dollar sales, etc...Currently the only public exhibition space is the mural project space in the front of the gallery, and this virtual space.